Massive die offs are currently more common than you might think, as reported from this (hopefully) unrelated article. Speculation of the causes range from global warming, the gulf oil spill and the CIA testing death rays. “There’s basically fish everywhere you go in the harbor,” said the harbor’s assistant manager, Jason McMullin, who added that there were reports that a red tide may have driven the fish into the harbor in massive numbers where they died because of limited oxygen. 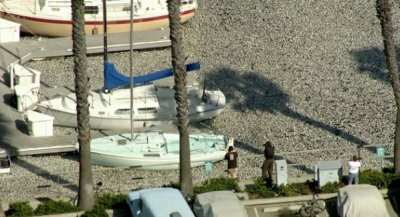 Updated at 12:15 p.m.: Redondo Beach officials said initial assessments suggest oxygen depletion in the King Harbor basins caused the massive fish die-off. Must smell nice around there. My neighbor works at one of the fish markets. The whole marina really smells rancid, and no the markets are NOT selling the dead fish.